Why did NKTR’s value increase by $7.5 billon on early cancer immunotherapy data? At the Cancer Immunotherapy ETF (Nasdaq: CNCR), we are committed to serving our investors through education and research. While we believe the best approach to investing is through a basket of stocks, we also think it is important to arm investors with as much knowledge about individual companies as possible. Therefore, it is our pleasure to provide research and news alerts as important events happen. Today we are providing some background research on a company that has seen its market value rise by more than $7.5 billion over the previous few months. Amazingly, this increase is due to some early patient data for a new immunotherapy drug that was only presented for the first time at a scientific conference in November. The company is Nektar Therapeutics (Nasdaq: NKTR) and the drug is NKTR-214. It is designed to increase the presence of effector T-cells in the tumor microenvironment. Immunotherapy drugs like PD-(L)1 checkpoint inhibitors have made a dramatic impact on many types of cancers. They are already FDA approved for types of melanoma, lung cancer, kidney cancer, bladder cancer, head & neck cancer, and Hodgkin lymphoma, just to name a handful of approved indications. Some well-known brands of this kind are Opdivo from Bristol-Myers Squibb and Keytruda from Merck. In biotech, we like to say these PD-(L)1 inhibitors work by taking the brakes off the immune system. For years researchers have wondered why immune cells do not naturally recognize cancer as foreign and attack it. One reason is because there is a protein marker on the outside of tumor cells called PD-L1 that cloaks them and holds the immune system back. The checkpoint drugs take the brakes off this cloaking mechanism by inhibiting the PD-L1 protein and allowing T-cells (a type of immune cell) to naturally attack. All of the above is great, but the right elements need to be in place for it to work well. Most importantly, a patient needs to highly express the PD-L1 marker and there also needs to be a lot of T-cells in the area so they can attack once the brakes are lifted. The latter, when there are many immune cells present, is what we call a “hot” tumor. Unfortunately not all patients and cancer types have those characteristics and, therefore, the drugs do not work for everyone. That is where Nektar comes in. They believe their drug NKTR-214 turns “cold” tumors “hot” and allows PD-(L)1 therapies to work for more patients. Nektar is attempting this by harnessing one of the oldest known immunotherapy pathways, interleukin-2 (IL-2). Interleukins are signaling molecules that communicate with the immune system and help guide it to launch an attack against disease. IL-2 has been promising enough on its own that FDA approved it as a treatment in the 1990’s. It has shown efficacy against certain cancers like kidney cancer, but unfortunately the therapy is so powerful and toxic that it is hard for patients to tolerate. Therefore, IL-2 has never been used widely in treatment like some would have hoped. That is why Nektar is trying to make a drug with the benefits of IL-2, but without the harmful side effects. Their drug NKTR-214 is a CD122 agonist. The IL-2 receptor on immune cells has three subunits, and CD122 is one of them (the beta subunit). By latching on to CD122, the drug signals certain immune cells (CD8+ effector T-cells are key) to proliferate. In preclinical studies, Nektar says they saw a 500 fold increase in exposure of NKTR-214 to the tumor area compared to what might have normally been seen with traditional IL-2 therapy. That is key given the dose-limiting nature of IL-2’s toxicities. Also important to NKTR-214’s potential success is the type of T-cells it is proliferating, those CD8+ effector T-cells. That is key because unlike with traditional IL-2, the drug does not also increase the presence of CD4-positive regulatory T-cells. Regulatory T-cells can suppress the good kind of tumor-killing T-cells and, therefore, it would be counterproductive if they also grew in number. Going back to the company’s preclinical studies, Nektar says they are seeing a 450 to 1 ratio of good CD8+ effector T-cells vs. bad CD4-positive regulatory T-cells. In short, Nektar is trying to increase the proliferation of cancer killing immune cells by using a selective, and hopefully less toxic version of the IL-2 pathway. If that works, it might turn “cold” tumors “hot” and allow PD-(L)1 drugs to work for more patients who might otherwise not benefit. This is a hugely important goal because depending on the type of cancer, PD-(L)1 drugs only work for 20%-40% of patients. We obviously want to see that number increased a lot higher to help more people with cancer. What does the data look like so far? 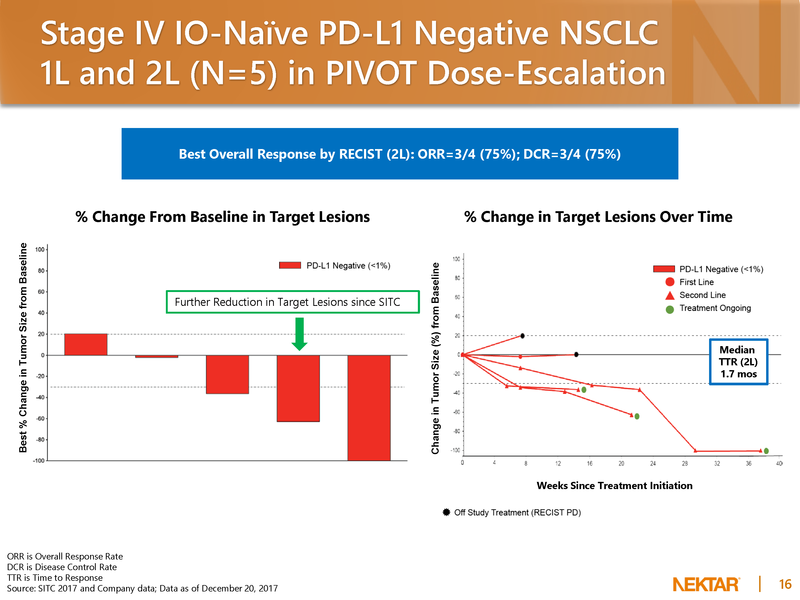 Nektar announced first-in-human data for NKTR-214 in combination with Bristol-Myers Squibb’s PD-1 inhibitor Opdivo in stage IV melanoma, renal cell carcinoma and non-small cell lung cancer at an immunotherapy conference called SITC on November 11th. Two months later, they updated the numbers at the J.P. Morgan Healthcare Conference in San Francisco on January 9th. While it is important to keep in mind this is very early data, what they have presented so far is certainly intriguing. Let’s take a closer look at the three cancer types and see what caused the $7.5 billion move. (64%) and the disease control rate (patients who have at least experienced stable disease) was 10/11 (91%). Two of the seven responses were complete responses, which is the best outcome possible because it means an absence of detectable cancer remaining after treatment. When you view the above data, take special note of the patients represented with red font. Those are PD-L1 negative patients, which means they do not have the natural characteristics that would normally suggest a checkpoint inhibitor like Opdivo would work on its own. It is very promising to see those types of patients appear to respond to the combination with NKTR-214 because it implies that the drug is providing added benefit. Also, a disease control rate of 91% is excellent. This is a very small group, but the data looks encouraging. In previously untreated stage IV first line patients, responses were seen in 8/14 (57%) and the disease control rate was 11/14 (79%). One of the patients experienced a complete response. As with the melanoma data, note how many PD-L1 negative patients in red seem to have responded to the combo. This is especially evident on the “spider plot” to the right, which shows the change in tumor size over time. It is encouraging to see so many patients with this stage of disease have tumor shrinkage like that, especially PD-L1 negative ones. study (CheckMate 214) in this patient population that combined Opdivo with a different immunotherapy drug, Yervoy. In that study, 41% of the 1,096 patients had a response to the combination and 24% had to discontinue treatment due to serious adverse events. 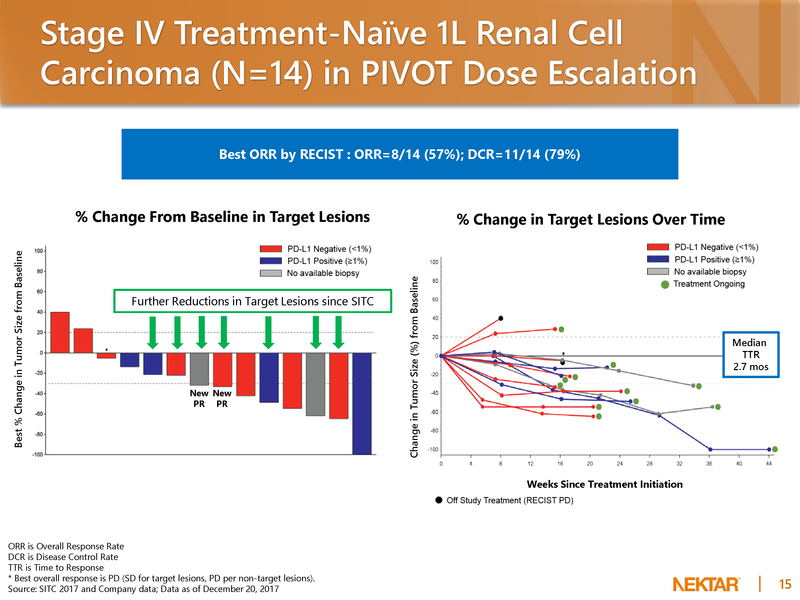 NKTR-214’s 57% response rate, therefore, looks comparatively encouraging if it holds up in larger studies. In previously treated (second line) stage IV patients, responses were seen in in 3/4 (75%) and the disease control rate was 3/4 (75%). One of these responses was a complete response. There was also data from one first line patient reported who has stable disease. Even though this is only five patients worth of data, the above lung cancer data might actually be the most impressive result of the three cancer types because stage IV lung cancer is very difficult to treat and all of these patients were PD-L1 negative. It is biologically improbable to have seen any response at all in these patients using checkpoints, let alone a result like this one. It strongly suggests that NKTR-214 is doing something. Furthermore, to see a complete response (an absence of detectable cancer after treatment) in a PD-L1 negative stage IV lung cancer patient is very rare with a checkpoint inhibitor. Why is this data so special? So is all of that worth $7.5 billion? Value, of course, is in the eye of the beholder, but there are some truly promising things about the data to consider. First, NKTR-214 might in fact be turning “cold” tumors “hot” by selectively causing the proliferation of effector T-cells in the tumor microenvironment and converting PD-L1 negative patients to PD-L1 positive ones. The evidence that suggests this comes from all the responses they are seeing in patients who start out with a PD-L1 negative baseline. Those patients are not likely to respond to PD-(L)1 inhibitor drugs on their own. NKTR-214 could be offering them a greater chance to respond. Second, the side effect profile has been relatively benign so far. 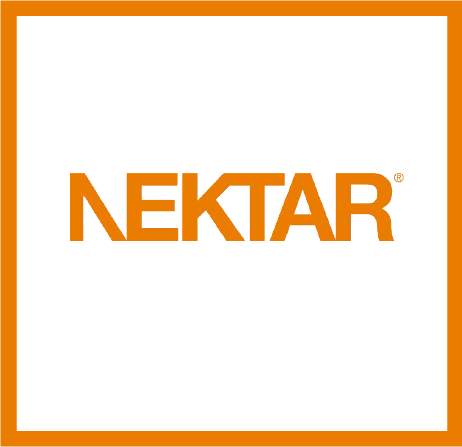 Nektar has not seen any patients discontinue the treatment due to adverse events and there have been no grade 3 or higher immune related side effects. The worst that patients have experienced so far has mostly been flu-like symptoms. That is key because it makes the drug day-and-night different than the very toxic traditional IL-2 and, amazingly, it even looks slightly better than what patients have experienced with PD-(L)1 drugs alone. It is hard to understand why the latter would be the case, but it might have something to do with the effector cells being local to the tumor while repressor cells stay in circulation. If both the efficacy and safety hypothesis of the drug is real and proven in larger studies, it could have a substantial impact on the field of cancer immunotherapy. Many patients who do respond to PD-(L)1 drugs have nice, durable responses. However, a sad reality is that currently only a minority (20%-40%) respond at all. There are hundreds of clinical studies underway trying to fix this problem that combine PD-(L)1s with other things. The goal is to figure out a way to boost the numbers. NKTR-214’s mechanism makes rational sense for doing that and now we have some data that seems to initially back it up. If the drug is able to successfully make checkpoint inhibitors work for a larger percentage of the patient population, it could indeed be very valuable. The potential benefit to patient lives and society at large is clear. From an economic standpoint, the opportunity is also compelling. Analyst peak sales estimates for PD-(L)1 drugs are currently more than $30 billion per year, even with the existing low response rates. Therefore, the economic incentive for boosting the percent of patients who respond is substantial. While the current data set is too small to say for sure if the drug is working, it does strongly hint at that and this explains why Nektar’s value has ramped so quickly on the data. The bottom line is that NKTR-214 could be a perfect companion to PD-(L)1’s. Those drugs can be great for patients who respond, but we know from experience that they are not likely to work for PD-(L)1 negative patients. NKTR-214 might be a critical helper that gives more patients the correct profile to benefit. What is next for NKTR-214? Remember that this is early. We only have a couple dozen patients’ worth of data and that is too little to be conclusive about anything. Much more research and more robust trials need to be conducted. What has been presented so far is truly promising, but we are only at the beginning of learning about NKTR-214’s profile. Below are some of the next things to watch. 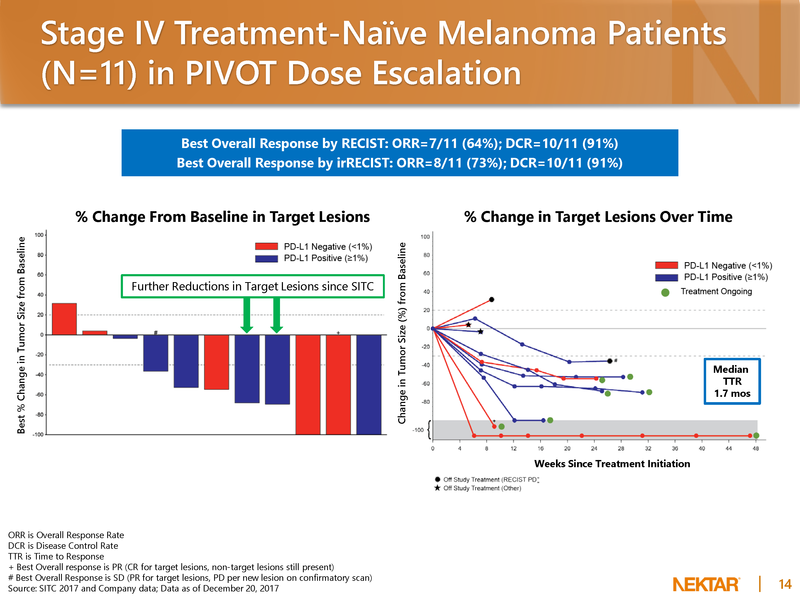 First, Nektar is building on the current data with an ongoing dose expansion study using NKTR-214 in combination with Opdivo in melanoma, renal cell carcinoma, non-small cell lung cancer, bladder cancer, and triple negative breast cancer. They will next present data from that in early June at the largest cancer research conference in the world, ASCO. Circle ASCO on your calendar (June 1-5) for a very important update. It will be a critical event for them because we will see if this early data holds up. a cancer of the bones and connective tissue called sarcoma. Sarcoma is sadly very difficult to treat and represents a big unmet need for new therapies. Therefore, it is theoretically possible that such a study could be used for a commercial regulatory filing with FDA if it produces positive data. The company is guiding to have initial data from the sarcoma study sometime in the first half of this year. Nektar also has combination studies underway combining NKTR-214 with Opdivo’s competitors. They are Merck’s Keytruda and Roche’s Tecentriq. Positive outcomes there would make it clear that NKTR-214 can be used with are variety of checkpoint inhibitors, which would provide the maximum commercial opportunity. Lastly, Nektar is also conducting a variety of preclinical studies using the drug in combination with other therapies like cancer vaccines that might enter clinical trials in the future. We hope you have enjoyed this research. Please keep in mind that even when something looks promising like NKTR-214, investing in individual biotech stocks comes with substantial risk. The Cancer Immunotherapy ETF’s diversified structure may help to lower risk as compared to investing in individual biotech stocks. We are pleased to support innovative companies like Nektar as they try to improve the lives of cancer patients. Thanks, as always, for your interest in the fund.